Advanced type of balance training device. 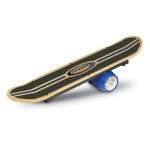 The board stands on a cylindrical roller so it offers another degree of instability – it takes a variety of exercises to an entirely new level. 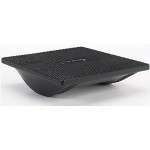 The most basic type of balance board – a wooden or plastic plate with a fulcrum on the bottom side. Rocker Boards can be used by anyone but are intended mainly for beginners and seniors. 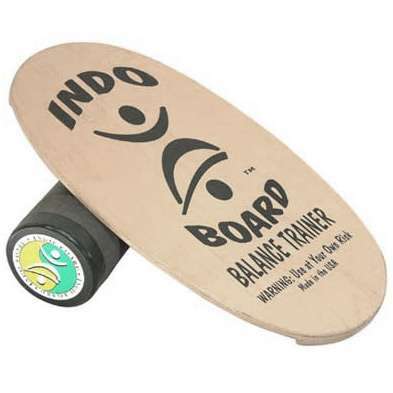 One of the most popular balance trainers. It consists of 30" long wooden board which stands on a large cylindrical roller – this system offers a great deal of instability. 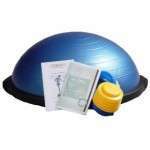 Balance Disc is a simple inflated rubber cushion which has a dual use: to provide an unstable surface for exercises like push-ups – or – for sitting to give you similar effect as the large exercise ball. BOSU looks like a half of a stability ball – and there lies it`s advantage: You can position it in two different ways and get entirely different possibilities for your training. 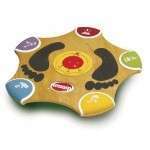 Wobble Deck is an electronic balance game designed mainly for kids. You can play the games simply by reacting to various sound and color signals and hitting floor with the right color side.